American artist Madeline Stillwell’s body of work combines elements of sculpture, graffiti, environmental art, dance, and theater, evoking themes of temporality and permanence, and highlighting the processes of breaking down and regeneration. 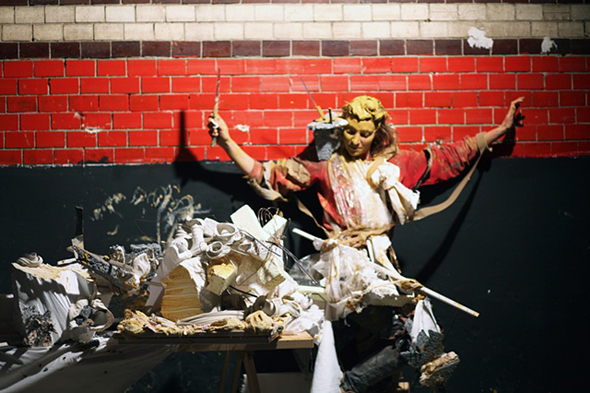 Most of her work centers on performances in which found objects and debris from the city streets are brought inside and transformed into an indoor urban wasteland. 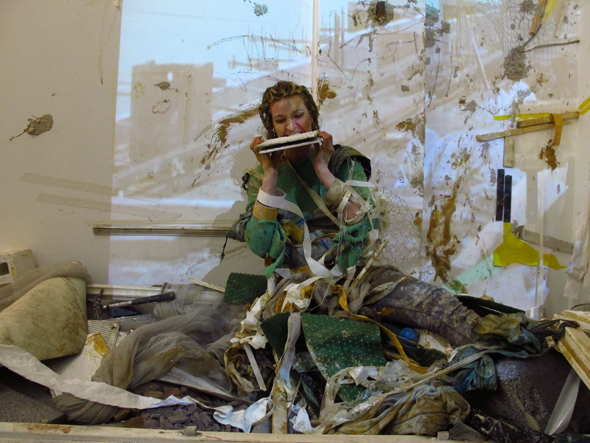 Stillwell gathers her discarded industrial materials from local dumpsters and construction sites and arranges them aesthetically; by the end of her performances, these surroundings are in ruins. Stillwell’s performances consist of her navigating through these assigned spaces and introducing wet elements such as paint, plaster, and clay. Watching her maneuver through broken scaffolding, wooden boards, concrete, bricks and plastic elicits a visceral response from the audience. Often she becomes entangled in these materials, or suspended above the ground to the extent that it becomes difficult to imagine how she might extract herself. The promise of physical pain evokes a specific type of response. One is captivated by all that could go wrong, but seemingly never does. Stillwell assures me that she has never been seriously hurt during one of her performances. Stillwell taught ceramics, drawing, and sculpture in New York City for six years in the early 2000s. During this period, she started producing what she terms “wet, unfired, ceramic graffiti.” She made ribbon-like clay forms and placed them around Brooklyn, documenting them over time as they deteriorated and changed shape. This was the first time she connected materials with performance. “All of a sudden,” she says, “it was as if the pieces were performing for me, because they were changing over time. And I thought, how can I make them move without having to wait so long?” In 2008, as she was completing her MFA at Cranbrook Academy of Art, her interest in working with organic materials gained a new dimension when she started constructing clay installations. Madeline Stillwell, “Photoshoot III” (excerpt), 1 min from Madeline Stillwell on Vimeo. It should come as no surprise that Stillwell has a strong background in theatre and dance. She moves with a dancer’s consciousness of the space around her and often relates to the jagged surrounding objects as fellow performers, allowing their presence to spontaneously influence her own actions. Stillwell is at once subject and object. At times she surrenders control to her environment, allowing accidental factors to manipulate her body in ways that leave her vulnerable and precarious, placing the viewer in a self-consciously voyeuristic role. Though they are public displays, there is something about the nature of Stillwell’s performances that makes them feel like private moments. There is a rhythmic nature to Stillwell’s movements, and she uses her entire body as an expressive tool. Stillwell says “movement and music have always been active in how I make marks” and that she desires “some kind of harmonious flow with the material.” Sometimes she hums when she finds it necessary. Her work is an expression of a type of human consciousness that is beyond everyday language. Madeline Stillwell, “No More Sugar for the Monkey,” 2009 from Madeline Stillwell on Vimeo. Stillwell’s performances contain a tension between control and chaos, specifically, of pushing elements to the edge of chaos and then reining them in. 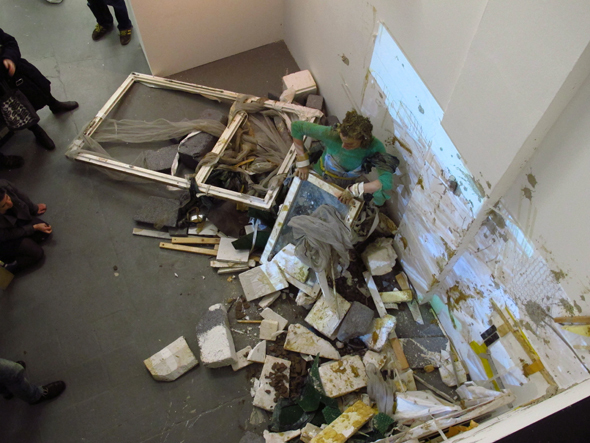 If something unplanned occurs, she explores it and somehow incorporates it into the piece, much in the vein of Jackson Pollock’s assertion that “there is no accident.” Stillwell does not stage her performances in dumpsters for good reason; there is a precision in her placement of debris and the selection of materials inside the gallery. During the performance, the originally ordered space becomes more chaotic, but it is an ordered chaos because of the consciousness the artist brings to it. Madeline Stillwell, “Untitled Wall Drawing,” 5 min. clip 2011 from Madeline Stillwell on Vimeo. Stillwell also produces drawings, which are an extension of her live work, reflecting the same restless dynamism and rhythm. Some are detailed preparatory sketches, and some of the most interesting are her collages, combining gestural drawing with her own cut-up photographs. Stillwell approaches collage in the same way she does performance; the result is a clash of materials that eventually combine to form a heterogeneous, synchronized movement. A thread of futility can be found in her performances, as one can not ignore the palpable suggestion that everything that can be built will someday turn to rubble, and that dealing with destroyed environments reflects something inherently fractured within the human psyche. Stillwell cautions against such a singular reading of her work. “I want to create something that represents not only futility but also productivity, so that there is a relationship between both the energy you put out and the entropy of something decomposing. I see a connection between the two. I sort of see life that way. When I first came to Berlin, I saw these monuments and then these huge piles of construction and scaffolding next to them. The fact that there were both was what interested me.” In her fearless communion with sometimes dangerous materials, Stillwell highlights the human capacity for endurance and survival. Through presenting the dynamism of building and taking apart structures, she signals the constant of change and our simultaneous propensity for continuous creation and destruction. Cara Cotner is an art and music writer based in Berlin. She holds a Master’s degree in Modern and Contemporary Art History from University College London. Her MA dissertation, “Out of Place: Tactical Operations in City Life,” concerned urban environmental art that uses city space to challenge the implicit rules of the urban setting. In addition to Berlin Art Link, she currently writes for EXBERLINER Magazine.